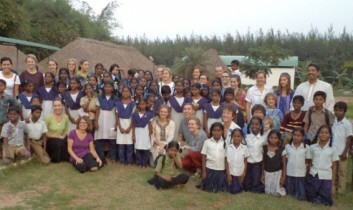 In December 2011, Sri Aurobindo Society (supported by the Sarvam Trust) hosted a group of 15 students from the University of Oregon, United States, for a three-week programme. As a part of this visit, the students were informed and made aware of, through enriching sessions, the various areas of research and development that the Society is engaged in. One of the sessions of the programme included introduction to typical Indian rural life, wherein they got to understand the simple and yet structured life of the village people. Another session gave them ideas on how to use media for social change, in the context of both urban and rural lives. In one of their site visits, these students visited the Poothurai village for an exposure to and physical view of the Indian village life and to learn about integral development of the community pervading all the aspects of rural life. It was truly an enlightening experience for the visitors, noting the impact and success of the four-dimensional approach of the Integral Village Development Programme. As part of the visiting students’ project, a couple of them designed a public health media campaign on the prevention of mosquito breeding in rural communities. Two architecture students took up a project on designing a shrine for the Ganesha (an elephant-headed God, very popular with the people in villages in India) and a coconut grove, after carrying out a detailed research on its significance to the life of the people in the village.